As psychologist and accredited coach, I am acutely aware of the problems YOU have with being able to effectively communicate and listen. There’s nothing like the experience of being in my profession for thirty plus years to tell you what works and what doesn’t! As a registered psychologist, I am dealing with many cases on a day to day basis. Life can be a struggle when our relationships are poor, when our career prospects are dwindling and when our business or profit is not going up. Listening and communicating. We all think that we do it…and well too. 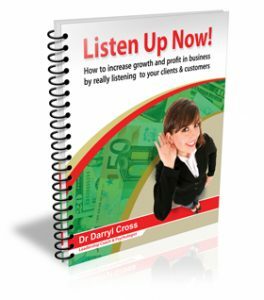 Listening… it’s the one skill that is assumed that everyone can do. But it’s also the one thing that people constantly complain that others don’t do – ask many employees about their bosses, ask many teenagers about their parents, ask many married couples about their spouses, ask your clients about the way that they are treated in your business or department. Why so? Because we are so intent on giving out advice, on giving our opinion that we don’t take time to listen. Is it any wonder that we mis-understand each other? Is it any wonder that we don’t connect with each other? However, you probably think of yourself as a reasonably good listener. If you asked those at work for their honest opinion, what would they really say? If you asked your family, what would they really say? You might be pleasantly surprised, but all too often, those we work with would say that we need to work on our communication and listening skills. Those we live with no doubt would say the same. Some may even say that we really need to work on our listening skills, that we are really poor listeners. What is the one skill that most consultants believe they have, but they actually lack? What is the one skill that most managers believe they have, but they actually lack? What is the aspect that adolescents say is the number one lack on behalf of parents? What is the one skill that due to its absence, is almost always at the core of every conflict? What is the one skill that, due to its absence, significantly loses sales and income? What is the one skill that, due to it’s absence, is almost always at the heart of marital or relationship breakdown? What is the one skill that is lacking in workplace dis-agreements? What is the one skill that separates out effective leaders from non-effective ones? What is the one skill that connects people together like no other? What is the one skill, that, if we all had it, would mean an entirely different world? Answer: The ability to listen! If it’s so important, so critical, so vital in business and in life itself, how is it that we don’t use this skill or have this ability? Your investment for this audiobook is US$9. You get the entire book professionally narrated for you in MP3 format, so you can listen in the car or on your iPod or any other device.